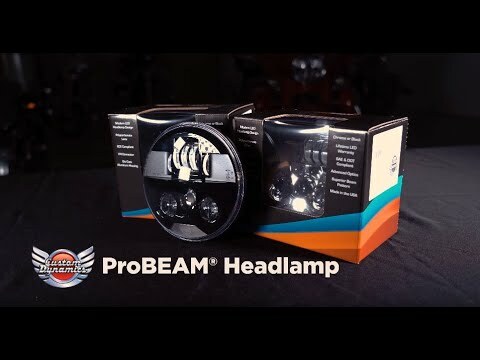 Custom Dynamics® TruBEAM® Headlamp is our premium 7" Round LED Headlamp designed for plug and play installation on 2015-2019 Indian® Chief® & Springfield® models, 2019 Chieftain®, Chieftain® Dark Horse, and Chieftain® Limited. The complex reflector design features three low beam LEDs and two high beam LEDs with a combination of projector and reflector type LEDs and built in halo ring. This combination provides superior low and high beam outputs. Durable polycarbonate lens with plug and play H4 connector. No additional trim ring needed. DOT and SAE Compliant. Available in your choice of Chrome or Black Chrome (Smoked) reflector. Lifetime warranty against LED failure. Sold Each. Custom Dynamics® plug and play Hi-Lo-Halo Adapter is required to enable internal DRL halo rings. In addition, this adapter will keep the center headlamp low beam on when the high beam is activated to provide maximum light output (sold separately). Pair with Custom Dynamics® 4.5" TruBEAM® Passing Lamps for Indian® if equipped. Alternatively, install Custom Dynamics® new ProBEAM® Headlamp and Passing Lamps. Additional TruBEAM® fitment available for 2015-2019 Indian® Chieftain® and Roadmaster® models. Plug and play on 2015-2019 Indian® Chief® & Springfield® models, 2019 Chieftain®, Chieftain® Dark Horse, and Chieftain® Limited. Custom Dynamics® plug and play Hi-Lo-Halo Adapter is required to enable internal DRL halo rings (sold separately).